This cards are made up of green stripe card stock. I covered it with green snow flakes Christmas paper with glittered green ribbon. Each card have a penguin with Santa's hat embellishment. Inside of the card left blank for your own use. Card size is 2" x 2". 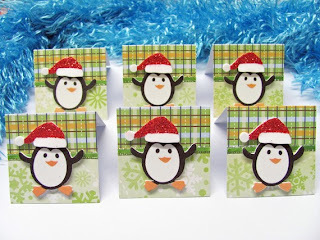 This cards can be use as a tag, quick Christmas note, note cards or anything you can think for it.